Related link World Duty Free. 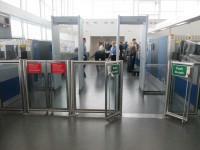 Security is accessed from the Check In area of the Terminal Building. It leads to World Duty Free. You are on Main Security Gates. Skip to the next section. There are a series of automatic gates at Security. 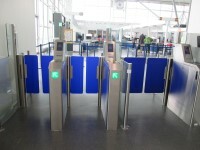 These are the main security gates. The gates are automatic and open away from you. The gates are 55cm wide. 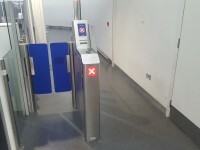 The FastTrack and accessible security gates are located to the right of the main security gates. 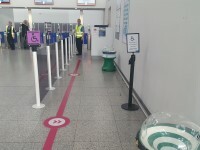 You are on Accessible Route to Security Gates. Skip to the next section. 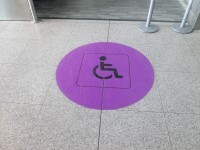 The purple floor route symbol at the Assistance Reception entrance is picked up on the approach to the security gates. 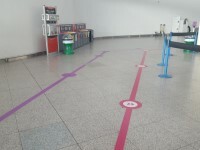 The purple floor route finder to the security gates starts at check in. 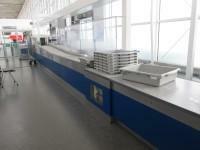 It takes you to the tables for removing items from your baggage that are not permitted through security. 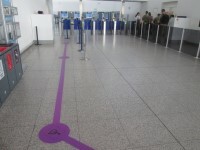 The purple route continues to the accessible security desk and beyond. 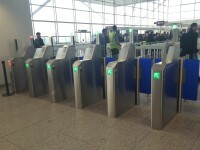 You are on FastTrack and Accessible Security Gates. Skip to the next section. 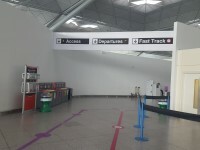 The FastTrack gate is on the right as you face security. The accessible gate is on the left as you face security. There is clear overhead signage. 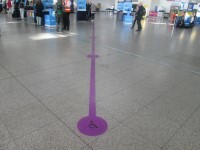 The accessible gate has a clear purple floor marked route. There is directional signage along the floor to the gates. 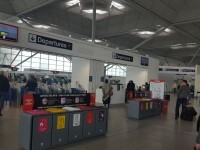 There is generally a member of staff on duty to check boarding passes and provide assistance. The gate is 88cm (2ft 11in) wide. The gate opens away from you. 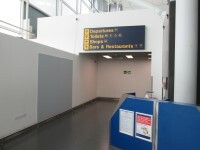 Once inside the security area there is a further gate to access the search area. The gate is manual and opens both ways. The gate is 84cm (2ft 9in) wide. The gate will be opened by a member of staff. The route between the gate exit and the search area is 100cm (3ft 3in) wide. 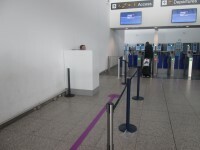 The width of the walk through scanner in the search area is 74cm (2ft 5in). You are on Security Checks. Skip to the next section. 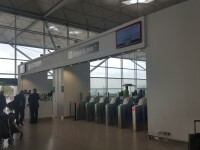 Passengers who cannot use the walk through scanner will be scanned by a member of staff. The luggage scanner is 90cm (2ft 11in)high. Members of staff will assist any passengers who need assistance. You are on Security Exit. Skip to the next section. There is level access to exit security. The exit leads to the Departure Lounge. 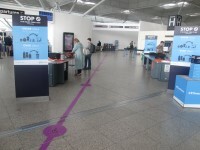 The nearest accessible toilets once inside the security area are located to the left as you face the World Shop. 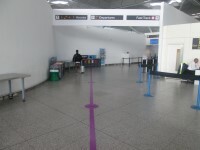 The nearest accessible toilets before security are located in the check-in area. 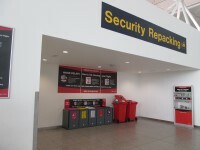 The nearest standard toilets once inside the security area are located to the left as you face the World Shop. The nearest standard toilets before security are located in the check-in area. Passengers can pay an additional fee to use the FastTrack security service.